Yoga by the beach: it sounds idyllic, right? Yet while beach yoga may make you feel like you’re on vacation, it has plenty of health benefits too. Taking your practice to the beach can help you challenge yourself, protect your body, deepen your poses, feel better about life and even recover faster. 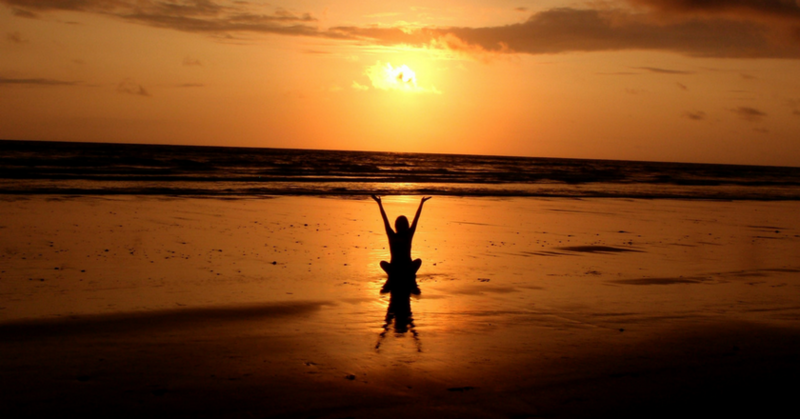 Find out all the reasons why beach yoga is a great way to keep your practice fresh. Exercising outside can greatly enhance your creative mind. All exercise in general is a creativity enhancer. The parts of your brain that become activated during exercise can help to enhance creativity. In fact, in the area of the brain called the hippocampus, your cells can regenerate faster if you exercise for at least 20 minutes per day. This is why going for a jog, taking a walk or swinging it out in a boxing class can help you solve your problems. When you take your exercise outside, it can help to enhance your creativity even further. Beach yoga can actually help you become more creative the more you participate in this activity. Exercising outdoors can help you become even more relaxed than when you exercise indoors. The simple act of communing with nature can have extremely positive effects on the nervous system. This coupled with the relaxing sounds of the ocean, the lull of the ocean breeze and even a few peaceful birds chirping, can greatly help you to relax as you’re in child’s pose. Simply feeling the wind on your face can help you relax too. It can also help you cool down a bit after an extremely vigorous session. It’s important to commune with nature. We humans forget about this sometimes. We’d rather be cuddled under a blanket in front of the television than we would against a nice sturdy tree in the forest. Yet sometimes we need to get back into nature. Feeling the grass under your toes, the sand in your feet and the fresh air on your skin can all help your body in different ways. Breathing in the sea air has many health benefits that are only enhanced with yoga. As long as you’re not doing beach yoga in an area with high pollution, you can enjoy all of the benefits of the sea air. Your body can actually absorb oxygen easier thanks to the negative ions that are present in the ocean air. These negative ions can also help naturally boost your serotonin, which can help you feel more relaxed and happier during your yoga session. As an added bonus, salt also has antibacterial properties. This mean that you’ll be able to recover faster from any infections or bacteria that you may have picked up throughout the week. If you need to add a little more difficulty to your practice, beach yoga has you covered with this too. When you rest your yoga mat on the sand, you’re not resting it on a sturdy surface (such as the wooden floor of a yoga studio). In addition to holding your poses, you’ll need to find a way to balance yourself on the sand as well. You’ll need to hold your pose, find your footing in the sand and make sure your hands don’t slide out from underneath you. Any exercise that you do outside is going to give you a huge boost in vitamin D—even on a cloudy day. Vitamin D is essential for regulating the calcium and phosphate in your body. You need plenty of this vitamin to feel happy and healthy. A lack of vitamin D is associated with autoimmune diseases, such as MS. Any exercises that promotes vitamin D will help you feel better about your workout overall. Vitamin D can also help keep your bones and muscles healthy—which is an important part of any yogi’s fitness routine. One of the greatest benefits of yoga is increased mood support. Many people start doing yoga because they want the mental benefits in addition to the health benefits. Yet taking your practice outside and to the beach can help enhance your mood even faster. Experts believe that going outside for only a mere five minutes more per day can help boost your mood by 50%. Imagine what an improvement a 90-minute yoga class could make on your mood. Human beings were made to be outside. It’s only within the past few thousand years that we began spending most of our time indoors. Heading out to the beach for your yoga class can make you feel even happier at the end of your 90 minutes. How many yoga classes have you attended indoors? If you have a solid number, you either have an amazing memory or you haven’t been doing yoga for long. How many yoga classes have you attended at the beach? It’s probably way less than the number of indoor classes you completed. Doing yoga in a setting you’re not used to can help you get out of your comfort zone. When you do yoga in a setting that you’re not used to, you start learning things about your practice you never noticed before. You may notice your body reacting to a pose in a different way. Or, you might feel completely different about a pose you normally love or hate. Getting out of your comfort zone can help you look at the world (and your yoga practice) through different eyes. While supporting yourself on the sand might add a little challenge to your workout, you’ll get the relaxed benefit of having a soft cushion of support underneath you. You might wan to try out a few more challenging poses on the beach because you won’t need to worry about falling on a hard wooden floor if you happen to get a few of the wrong. The sand can also help to support you in different poses. Anytime you’re sitting on the sand, you may find your hips and bottom supported by soft sand. In a yoga studio, you’d need to surround yourself with blankets and bolsters to get that kind of support. Any exercise that you do outside requires a little extra effort when it comes to focus. When you run outside, you’ll need to avoid cars, pedestrians and cyclists. When you do your yoga on the beach, you need to find a way to remain in downward dog without losing your focus to bugs, birds and any other disturbances that you might encounter. Let’s face it: whenever you take a workout outdoors, you’re going to experience way more disturbances than you would in the comfort of an indoor studio. Sometimes we’re used to creating the “perfect” conditions when it comes to our yoga practice. If it’s hot, we turn on the air conditioner. If it’s cold, we turn on the heat. If it’s windy, we close the window. When you’re doing yoga on the beach, you can’t just turn off the weather. If it starts raining, you accept that situation as a part of the practice. If it’s extremely hot, you adjust your practice to fit the temperature. If it’s a little chilly, you throw on a sweater. Beach yoga is all about learning to adjust your attitude when things get rough—and not about trying to adjust everything else in the world around you. You can also use beach yoga as a metaphor for life. When it starts to rain, will you pack up and go home? Or, will you press on with your practice? When things get rough in life, do you throw in the towel? It’s all to easy to allow yourself to quit when things get rough. Before your yoga practice, you could fit in a beach run or a swim. How many times have you run to your yoga class or swam home? Beach yoga gives you a little flexibility and offers you the opportunity to double or triple your workouts. You can even use the local beach swing set as a prop to help you get in a stretch before your run or swim. When all is said and done, one of the best reasons to practice beach yoga is because its—well, by the beach! After a yoga class, you probably head straight for the locker rooms or head home to shower. After doing beach yoga, you simply need to head to the surf to cool off a little. Just remember to wear Lycra undergarments, so your skin doesn’t feel chaffed from synthetic materials and sea water rubbing on your skin. If you don’t have to head to work for the day, you can even relax in the sand for an hour or so to continue soaking up the benefits of the Great Outdoors. 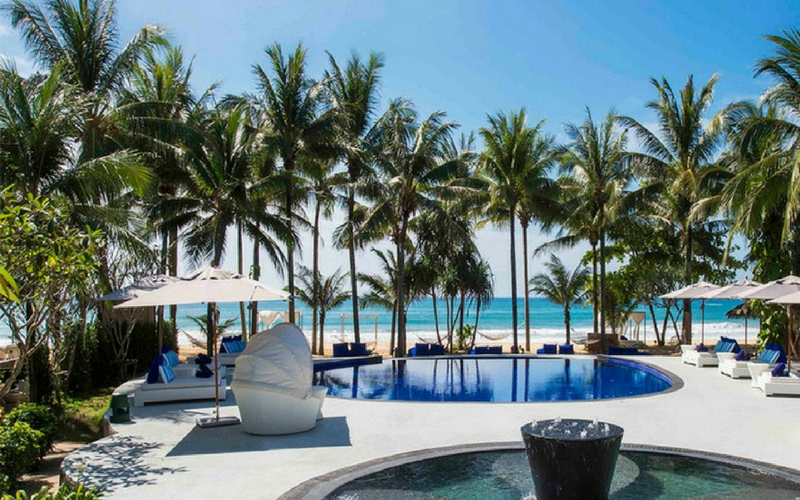 Our five star beach resort in Phang Nga, Phuket located on the pristine sands of Natai Beach offers the ultimate refreshing and renewing resort experience, the peace and tranquillity found at akyra offer an enchanting escape. Beach Yoga class is offered to guests as part of the resorts activities and our professional instructor can teach everyone from beginners to regular yoga practitioners.